Today, I bring you more blurry photos with direct, middle-of-the-day sunlight! I took these the same day as the ones for my last post, so don't judge. Instead, feast your eyes on this handsome little man in his Day Camp Set by Peekaboo Pattern Shop! 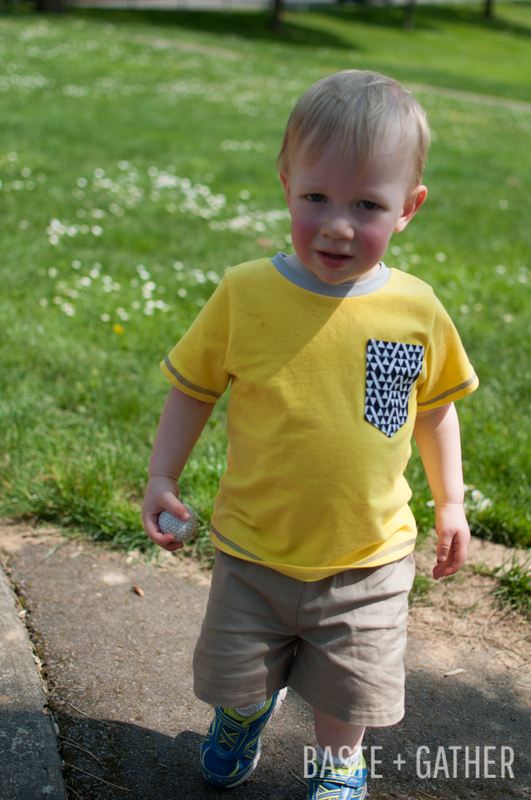 Both the tee and shorts are FREE and come in sizes 2T-5T. I made both in a 2T for Ezra who is 20-19-21, about 34-35" tall and 27-28lbs. He typically wears 18-24mo in Gap/Old Navy clothing and is quickly moving into 2Ts. You know how I like to make my kids' clothes with a little room, so if you're questioning whether to size up if in-between on these, I'd go up. I've found that Amy's patterns are usually very true-to-measurement with little growing room. That's a great thing if you want a trim-fitting, nice-looking garment. The only modification I made was to lower the front neckline of the tee by about 5/8-3/4". As you can see, it's spot-on for him. The yellow jersey (tee) and twill (shorts) are both from Fabric Depot in Portland. The geometric jersey was something I had left over from another project and came from Wanderlust Fabrics. The ribbing is from my stash. I did some decorative coverstitching on my Janome Coverpro 1000CPX. I regret not taking some close-ups of the stitching, but oh well. Such is life! SO, if you have a toddler/preschooler, go grab this free pattern! Both the pieces could work for a girl, too, with simple modifications (or exactly as they are, really). Whoop, whoop - Harper has finally decided she likes having her picture taken! And I finally decided to get my camera out! And no, I didn't sew and photograph this all in one hour! I made it weeks ago. But I digress. First, let's talk about...womp womp womp...my photography for this post. A long, long time ago (last summer/fall)...in a far away land (Salt Lake City and surrounding)...I took great photos. Well, I took decent photos. I knew all the great spots and had golden hour figured out LIKE A BOSS. Enter Portland. We moved last November, and despite my efforts to set up a little in-house studio, my photography has gone downhill really fast. There are several reasons. My camera has basically been missing in action since November. I mean, I've known where it is. But I haven't used it much at all. When I took the pics for this post, I basically put it in auto and went with it. I had limited time, and I was so excited Harper was cooperating, the thought of figuring out manual again was the last thing on my mind. I haven't figured out the lighting situation here just yet. Obviously, these photos were taken in the middle of the day - BAD, bad, bad...I know. But I did what I had to do considering I am now 38 weeks pregnant and basically can't get the kids to the park without help. Golden hour here is truly magnificent - especially on the rainy-turned-semi-sunny days, but you know...it comes kind of late now, and my kids go to bed at 7:30...and, well. It is what it is. I also haven't scouted out any great locations. I mean, I'm surrounded by them. Portland is GORGEOUS. But I need to find those *perfect* places that are semi-secluded and that I can get to easily with two (soon, 3) small children. So yeah. I know you guys get it. But let's talk about this out-of-focus outfit, shall we? The top is a FREE (yes FREE!) pattern by It's Always Autumn called the Flutter Sleeve Top or Dress. It only comes in size 4, but that was perfect for us. I did shorten the neckline elastic a little because I found it was a little too spicy for my narrow-shouldered girl as directed in the instructions. Super easy to sew - super fast to sew - looks great - check, check, check. The skirt is the Swingset Skirt by Oliver + S. I have only recently started sewing O+S because I don't know why...but I am loving the patterns. I think that maybe I find their pattern cover artwork a little distracting - like I can't really see what the garment looks like as they're drawn? Maybe. I'm more of the line-drawing-and-simple-photo kind of sewist when it comes to picking out patterns. BUT: I'm so glad I started using them because they really are as great as people say they are. Harper's measurements are all-over-the-place for O+S; she's 21-20-22 which translates to anywhere from a 12-18m to a 2T, but her height (38") puts her pretty squarely in a 3T. (She is almost 4 and weighs around 32lbs in case you're trying to compare your kid's size/age to mine.) I had heard O+S patterns run big, but I am one of those annoying people who errs on the large side when sewing for my kids, so I went with the 3T. I also lengthened the skirt a hair - maybe 5/8" - but as you can see, that probably wasn't necessary. The great thing is that the skirt has a drawstring waist with light elasticity, so she will get to wear this one for a long time without looking sloppy. The trickiest part of sewing the skirt (and I use that term loosely) was lining up the buttonholes in which to feed the elastic/drawstring. They are pretty tiny buttonholes, so that could be a deterrent for some. You could probably substitute some grommets there for a different look if you so chose. I love doing buttonholes though! Both garments were quick and easy, and I highly recommend either/both. I'm going to keep this short and sweet so I have some time to go back and read my camera manual tonight (hahaha), but I've been sewing a ton for the kids these last few months and hope to have some more to share with you soon. TOP FABRIC: London Calling (voile) in SWEET by Robert Kaufman SKIRT FABRIC: Lightweight denim in Bleach Indigo Wash by Robert Kaufman SHOES: Cherokee Brand Joan Glitter Sandals @ Target (the similar-looking ones from Old Navy are of inferior quality! Trust me!) All fabrics purchased at Fabric Depot in Portland, Oregon. I made this lace-back Celestial Tee by Figgy's earlier this week during my Kids' Clothes Week / Perfect Pattern Parcel sewing frenzy, and I just adore it!! It looks fabulous on Harper, and it was super easy to create. I love that it gives lots of visual bang with minimal effort. Both fabrics were purchased at Jo-Ann. The floral is a very stretch 4-way knit, and the stretchy lace came from the fancy fabrics aisle (that I rarely visit - this will change!). This was the first Celestial Tee I made using the flat instructions included in the pattern - in other words, I usually sew my neck band on after the garment is completely constructed as opposed to after one shoulder is sewn. I like not having the serged edge go right to the edge of the neckline, but working flat ensures a nice, tightly-fitted neckband that doesn't droop or stretch out. I think I'll be doing it a lot more in the future and just making sure I clean up that edge by tacking it down nicely at the end. With right sides together, sew those two pieces together where you just added the seam allowance using a 1cm seam allowance. Proceed with the rest of the pattern as written!